I saw this post at the Oh Fransson website the other day and I just knew I had to do this. My room is so full that I can't fit a real ironing board in there (which is a shame because I have a cool antique one) so I have always had to go through two rooms to get to the room with my ironing board in it. This was such a pain for when I just needed to quickly press a seam or two on a small piece. So I made this to keep next to my desk and I can just fold it up when I'm not using it. I will still use my big board for big stuff but for the times I just need to iron seams in a single block this should be perfect. 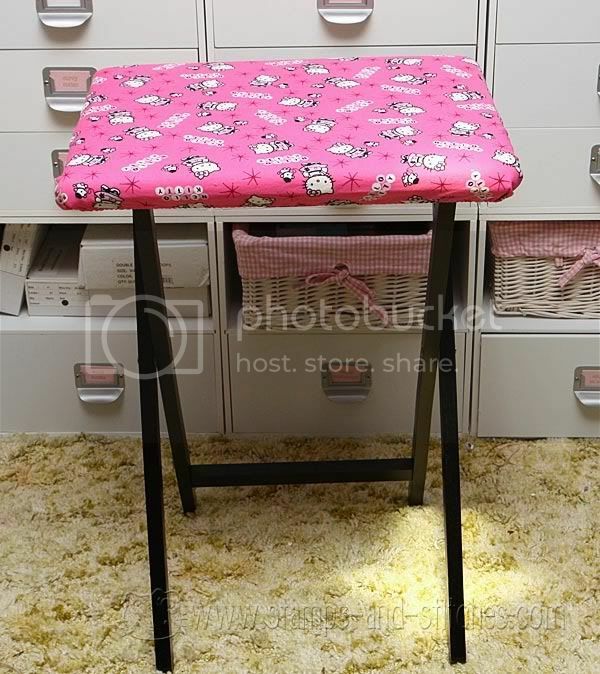 The only things I did differently: I used two layers of insul-bright thermal batting (which I had leftover from when I covered my big ironing board), no batting, and a layer of canvas under the fabric. Also instead of stapling the top fabric on, I stitched a casing and put elastic in so that I can take it off to wash or change it. I made sure it was pretty tight but I'm not worried that it's not super tight since it'll only be for little things. I did get the same exact tv tray-it was still $9.99 at Walgreen's. I apologize for the weird reflections (I used flash) and the hideous carpet (someday...). What a cute, GREAT, idea Gale!! I love it!! What a GREAT idea! I so need to do this for my quilting projects! Love the fabric!!! this is such a great idea and so well done! SOO cute!!! I LOVE Hello Kitty too!! Since I was a little kid! Great idea........now I know what to do with that TV tray that's been sitting around gathering dust! What a terrific idea! I may do the same thing. 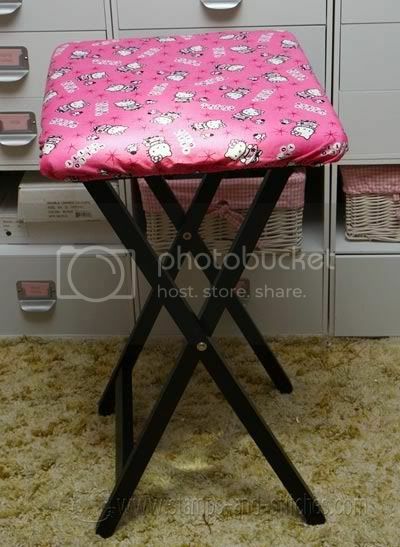 Your little ironing board/table turned out so cute! Aaahhhhhhaaaa! This was one of those lightbulb go off moments, wasn't it? You know, when a brilliant idea hits and you wonder why you didn't think of it sooner. This is amazing! Oh my I love, love this. I only have one of those mini board that you do sleeves on. I so want to do this. So super love this idea!!! !